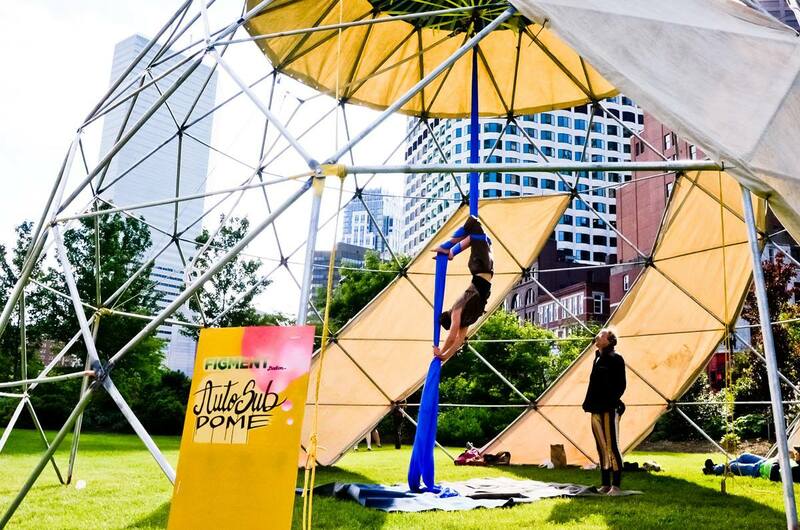 This weekend, huge chess sets, super-sized raindrops lit up with interior LED lights, and improvisational theatre ensembles will transform the Rose Kennedy Greenway into a large-scale, interactive art festival for two days when Figment Boston returns for its sixth year. Figment is a free, volunteer-run, participatory art festival that encourages visitors to become more than just spectators and physically interact with the works. Giant marimba steps and bubble wrap dance floors are just some of many art pieces that will be at the festival. In the past, Figment has also featured inflatable art, social experiments, costuming, and bands and DJs. Everyone—adults, children, professional and less-experienced artists—is welcome to bring their own art to the event, as long as it encourages participation from other visitors. What originally started as a one-day art event at Governor’s Island in New York in 2007 soon branched out to other cities for multiple days, including New York City, Detroit, Washington D.C., Pittsburgh, and Boston. Figment gives artists an opportunity to showcase their work while also giving spectators of all ages, races, and socioeconomic backgrounds easy and free access to public art for an entire weekend. At this festival, creativity and inspiration knows no bounds. At FIGMENT, guests can tell stories about things that happened throughout their day to an improvisational theatre ensemble, who will then act the story out for them. If it isn’t quite right, the troupe of actors can take a second stab at it with help from visitors. The festival will also feature a giant typewriter, called the Blunderwood Portable, with keys that people can walk on. And on Saturday night, from 6 p.m. to 11 p.m. the Greenway will turn into the FIGMENT After Dark Dance Party, featuring light art specifically designed for nighttime and DJs to help keep the party going all night long. Though plenty of public art installations have popped up throughout Boston this summer, Figment is unique in nature. Figment will be at the Rose Kennedy Greenway on Saturday, July 25, from 11 a.m. to 11 p.m., and Sunday, July 26, from 12 p.m. to 6 p.m.